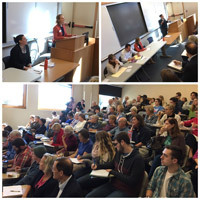 Community members filled Sverdrup to hear perspectives on environmental policy. Students, faculty, staff and local community members filled Sverdrup 101 to standing-room only capacity on Wednesday for a panel discussion on what impact the U.S. election results will likely have on environmental conservation and health policy and sustainability initiatives. Panel speakers included Webster faculty members Amanda Rosen, associate professor in History, Politics and International Relations of Webster's College of Arts & Sciences; Don Corrigan, professor in Communications and Journalism of the School of Communications, environmental issues author and editor of the Webster-Kirkwood Times newspaper; Webster student Megan Price, Student Government Association vice president; and Rep. Jeanne Kirkton of the Missouri House of Representatives. Also in attendance was Sarah Unsicker, who was elected to fill out-going incumbent Kirkton's seat in the Missouri House. Rosen discussed what changes to expect in all three federal branches of government under an administration led by Donald Trump. Corrigan discussed how these issues are covered in the media and how citizens can let media know what issues are important to them. Price shared some of the activities Webster students and students from her generation have prioritized. Kirkton offered perspectives at the local level with Missouri now having a Republican governor-elect and "super majority" of Republicans in both houses of the state legislature. The panel was moderated by John Hickey, chapter president of Missouri Sierra Club, which co-sponsored the event with Webster University Sustainability.